To request a quote for one of the Altivar Drives, please email sales@mrodrives.com or call 800-691-8511. How do you configure the sink and source switch on the Altivar ATV312 drives? You can check the sink source switch position by checking to see what position the sink source switch is set to on the printed circuit board of the ATV312 drive. How to program an ATV312 for PID control? Several factory default functions are incompatible with PI control. Does the ATV312 have Brake Logic Control? The ATV312 does have a Brake Logic Control function. This enables the drive to manage an electromagnetic brake. To program it, go to menu FUn, Application Functions, and sub-menu bLC, Brake Control. Does the ATV312 drive has a reverse inhibition function? No the ATV312 drive does not have an reverse inhibition function. Can you do a multipoint addressing with the ATV312 drives? It is not possible to do multipoint addressing with the ATV312 drives. The menu for the configuration can be displayed on the remote HMI but it is not a working function of the drive because the function has not been implemented. If you want this feature you will need to use the ATV61 or ATV71 drives – MRO Drives stocks these series as well. What to do when getting an Internal Fault on an ATV312? • Remove all control wiring. • Check ribbon cable to control board behind the display. What does Suffix S385 mean on the ATV312 drives? Suffix Version S385 version of the ATV312 is restricted to the OEM Automatic systems. The S385 means its s specific version. The ATV312 S385 version has 16khz of PWM frequency allowed for all speeds. Also some of the factory default settings are not same as the standard drive. How is the ATV312 programming returned to the factory defaults? Where can I find basic programming information for ATV312 drive line? WHEN in 2C (2 wire control) LI1 is the Run Forward input. When in 3C (3 wire control) LI1 is a Stop input, LI2 is Run Forward and LI3 is Run Reverse. Where can one find max line current values for the ATV312 drives? The input line supply values are going to be for voltages between 200VAC to 240VAC or 380VAC to 500VAC 50/60hz. Can the Altivar 312 program be changed while the drive is running? Most parameters cannot be changed when there is an active run command. However, some can be adjusted while the motor is running. All parameters can be viewed either way. How do you set up the preset speeds on the ATV312 drive? How many digital inputs and relay outputs come on the ATV312 drives? Can the ATV312 drive switch from local keypad control to remote terminal control by pressing and holding the mode button? Yes , the drive can be changed back and forth between local keypad control and remote terminal control by holding the mode for 3 seconds. However, when returning to remote from local some of the drive parameters will return to the default factory values. What is the ATV312 Modbus register number for Speed reference in RPM? The modbus address is 8602 (1-1 rpm, if bit 9 of CMI =0). What does CC mean at the end of an ATV312 part number? The CC extension is a logistic reference. There is no impact drive reference: The product inside the package is unchanged. How do you put the ATV312 drive in local mode or remote mode? Hold the Mod button for 3 seconds unit the 3 LED start to flash 1,2 3, and display shows LOC. If you need to go back to remote mode hold the Mod button again for 3 seconds and the 3 LED lights will stop flashing and go out. Please be aware if you take the drive out of local mode and put it back in remote mode it will reset your logic inputs and Reference inputs back to factory default. Can the ATV12 keypad be used with the ATV312 or ATV32 drives? Yes, plus you need to order either the 1 or 3 meter ATV61/71 cable to use with it. How can you copy a old ATV31 program into a new ATV312 drive? You can copy the old ATV31 file into the new ATV312 drive. You will need to set up your new ATV312 to act like a old ATV31 by setting the ArE parameter to 31E or 31A. 31A has the knob on the face of the old ATV31 drive. 31E does not have the knob only the 4 buttons on the face of the drive. To copy the old program from the ATV31 into the new ATV312 drive you will need the original ATV31 remote keypad, Powersuite software V2.6 or the Multiloader. What drive product line will replace the ATV312? The ATV320 drive is the recommended replacement to the ATV312. 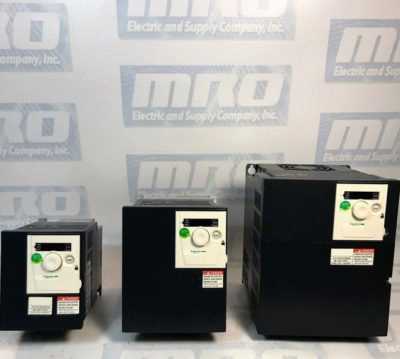 Contact MRO Drives for the recommended replacement if you would like to upgrade, or view the list below to find the corresponding part number.